Dale Hall, Burslem, Stoke-on-Trent, Staffordshire. Dalehall - a district of Burslem, arranged either side of Newcastle Street. Nowadays Dalehall, although preceding it in antiquity has been subsumed into the general area known as Middleport. The Burslem family were living at Burslem by the end of the 13th century. By the end of the 16th century their Burslem house was Dale Hall, by 1616 they had moved their Burslem home to the Overhouse on Burslem Bank, and on the division of the family estates in that year the Overhouse and Dale Hall were assigned to Thomas Burslem, his younger brother Robert taking the Park estate. When Thomas died in 1628 both the Burslem properties passed to his younger daughter Katherine and her husband William Colclough. Dale Hall, in the tenure of a Thomas Robinson in 1666, passed on Katherine Colclough's death in 1669 to Burslem Wedgwood, her great-nephew. He may have been living there in 1673, but the hall had evidently been abandoned by the early 18th century. The site is thought to be in the built-up area south-east of St. Paul's churchyard. By 1832 there were several streets of houses off Newcastle Street in the Dale Hall area. Union Buildings in Newport Lane had been erected by 1817; Mount Pleasant Buildings in Reid Street dated from 1819; and Fountain Buildings in Newport Lane were built by Enoch Wood's workers in 1824. In the late 1830's Church Square, Newport Lane north of Newcastle Street, and Lyndhurst Street were being laid out around St. Paul's Church, Dale Hall (built in 1828–31). 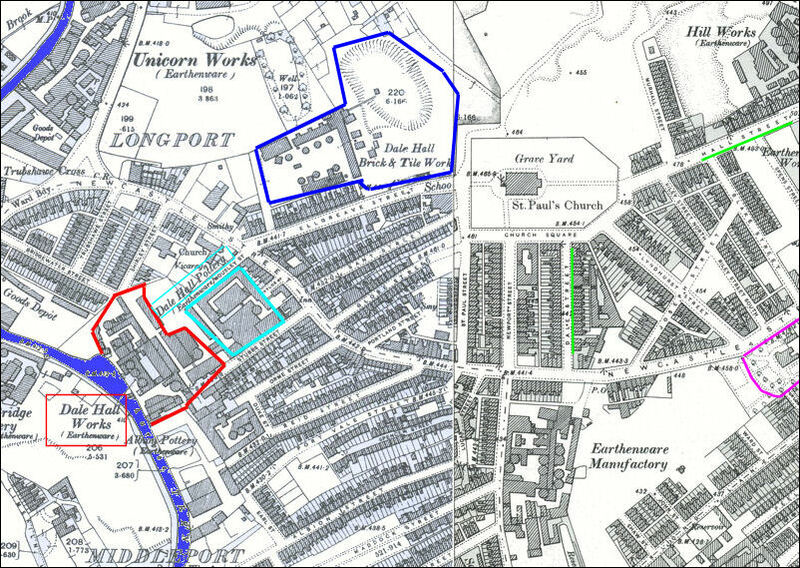 Longport, however, remained distinct from Burslem, even in 1851 when Dale Hall stood isolated between the two places. In the third quarter of the century streets were constructed on both sides of Newcastle Street, and the area around Longport station, opened in 1848, was developed. 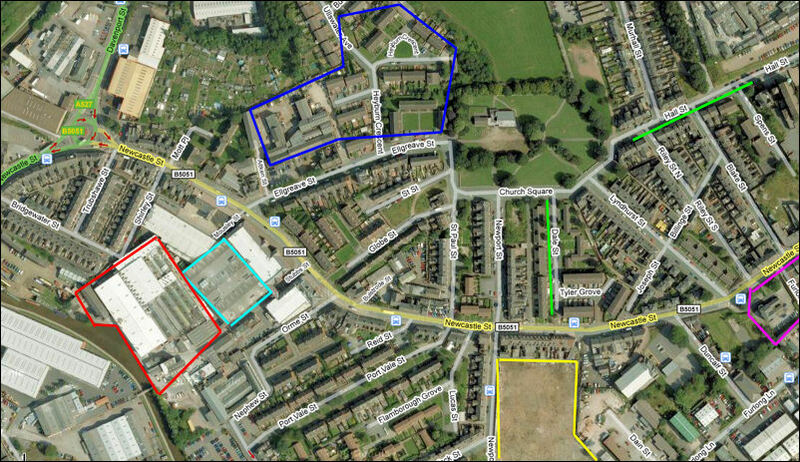 The streets laid out over the Davenports' Longport Hall estate were being planned by 1885. By the late 1950's several of the terraces off Newcastle Street had been demolished or abandoned, and a new estate was being built on the site of those in the area around Port Vale Street. The line of the road from Burslem to Trubshaw Cross was altered so that it became the present Newcastle Street, and in 1828 the old road was sold. St. Paul's parish church is clearly seen in the top right centre of the map. St. Paul's parish church can easily located - unfortunately the "large and handsome Gothic edifice" of 1828 shown in the 1898 map was demolished in 1974 and replaces with a uninspiring shed of a building.